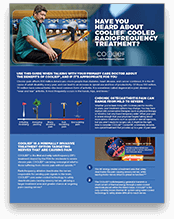 Is COOLIEF* Cooled Radiofrequency the right option for me? In clinical studies, most patients receiving COOLIEF* reported that their pain was significantly reduced. COOLIEF* has been proven to significantly improve long-term physical function and quality of life for OA knee patients for up to 12 months. Because the procedure is minimally invasive, most patients can expect to feel pain relief within 1-2 weeks, returning to an enhanced quality of life much sooner than with surgery. Since this outpatient treatment requires no general anesthesia, you can return home shortly after treatment. Unlike surgery, COOLIEF* involves no incision. Opioid prescriptions are often given to patients as a first-line treatment for both acute and chronic pain, although long-term effectiveness has not been proven. In fact, several studies have shown that use of opioids for chronic pain may actually worsen pain and functionality. Not sure if you’re ready for COOLIEF*? Talk with us during your visit using this guide.